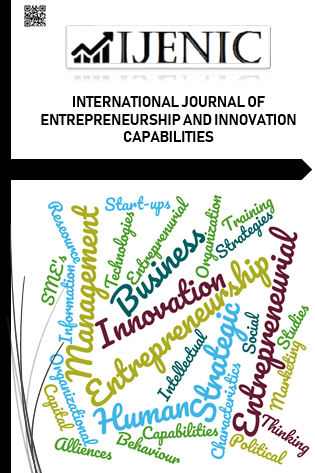 International Journal of Entrepreneurship and Innovation Capabilities (IJENIC) is a double-blind reviewed, open-access and scholarly journal dedicated to publishing research articles in English and Turkish Languages. The journal aims to publish original and outstanding studies that improve knowledge and understanding of entrepreneurship perception and innovation capabilities of the new entrepreneurs. IJENIC does not charge for any article submissions or for processing. International Journal of Entrepreneurship and Innovation Capabilities (IJENIC) is a multi-disciplinary journal published as annually. The Journal (IJENIC) covers all the main and subfields of business and management researches within social sciences and especially focuses on entrepreneurship and innovation studies. The main purpose of the journal is to convey the latest developments and researches on the business management and entrepreneurship studies towards the related scientists and to the readers. The Journal is also involved in both experimental and theoretical studies on the subject area of entrepreneurship and innovation capabilities. Submission of an article implies that the work described has not been published previously and it is not under consideration for publication elsewhere. All the responsibilities for the article belongs to the authors. The publications of papers are selected through double peer reviewed to ensure originality, relevance and readability.